Home / Oil / Is the Oil Correction Over? Is the Oil Correction Over? The price of oil is seeing its biggest decline today since February 23. The ostensible reason is that Iran once again reiterated it would only consider capping its output after it reached four million barrels a day, its pre-sanction output. Last month, the Saudis and Russia (joined by Venezuela and Qatar) indicated they were prepared to freeze output on the condition that the Iranians (and others would join). It was clear that the Iranians could not and would not join. Iran had just abandoned its nuclear ambitions to have sanctions lifted. If it prematurely froze its oil output, it would have ended its nuclear program for nothing. We must assume that the Saudis realized that Iran would not participate. Nevertheless, the Saudi offer to freeze was valuable tactically. First, it deflected some of the blame for low oil prices away from itself and toward its rival. Second, the offer to freeze output was also a ploy to force an issue that showed a conflict of interest between Iran and its ally Russia. Third, Saudi Arabia (and Russia) prepared to freeze output in February by boosting production in January. Fourth, a freeze makes for favorable headlines without much substance as many OPEC producers were operating near capacity. The Iranian position means that there most likely won't be a summit between OPEC and non-OPEC producers this month. April seems to be the earliest, but much hinges on Iranian output. According to OPEC data, Iran boosted its output by 190k barrels a day in February to reach a four-year high of 3.13 mln barrels. It aims to boost output to 4 mln barrels by the end of the first half of the year. However, this appears to be a bit ambitious, and it may take a little longer to reach its goal, due to domestic bottlenecks. US shale producers were never likely candidates to join an OPEC, and non-OPEC output freeze let alone a cut in production. The timing of Iran reaching four mln barrels a day in output may be the key to a wider agreement to cap output. Ironically, US shale producers stand to benefit from any agreement to push prices higher. 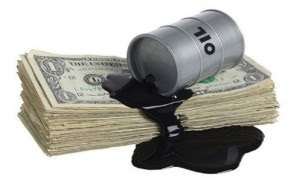 The continued technological advances have lowered the breakeven of some of the US largest producers to $40 a barrel, according to recent reports, from $60 a barrel a couple of years ago. The losses in the May sweet light crude oil futures today have not done much technical damage to the near-term outlook. The contract has been struggled most of the last week to sustain gains above $40. A break of last week's low of $38 a barrel could be an early indication of the three-legged correction since mid-January has run its course. The first downside target is near $36.75 and then $35.60. Note that the May contract is set to close below the five-day moving average (~$39.40) for the first time since February 24. The RSI is turning, and the MACDs may turn lower in the coming days. The Canadian dollar and Norwegian krone are particularly vulnerable to a setback in oil. The Norges Bank is expected to cut rates 25 bp later this week and lower its repo path guidance. In the emerging market space, Mexico, Colombia, Russia, and Nigeria are also at risk if oil prices turn lower.